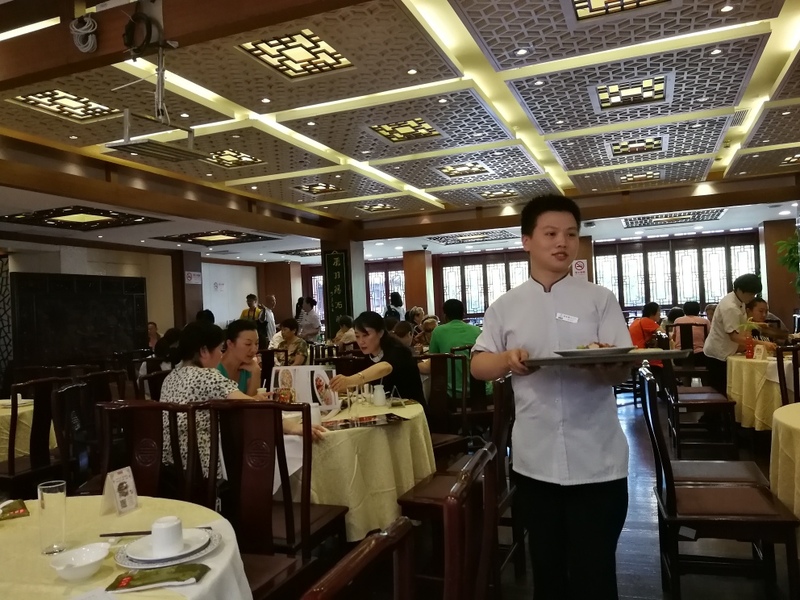 绿波廊 is THE restaurant in the Yu Garden food scene. Sure, it seems touristy (and is indeed increasingly so), but don’t be fooled. This restaurant is legit. 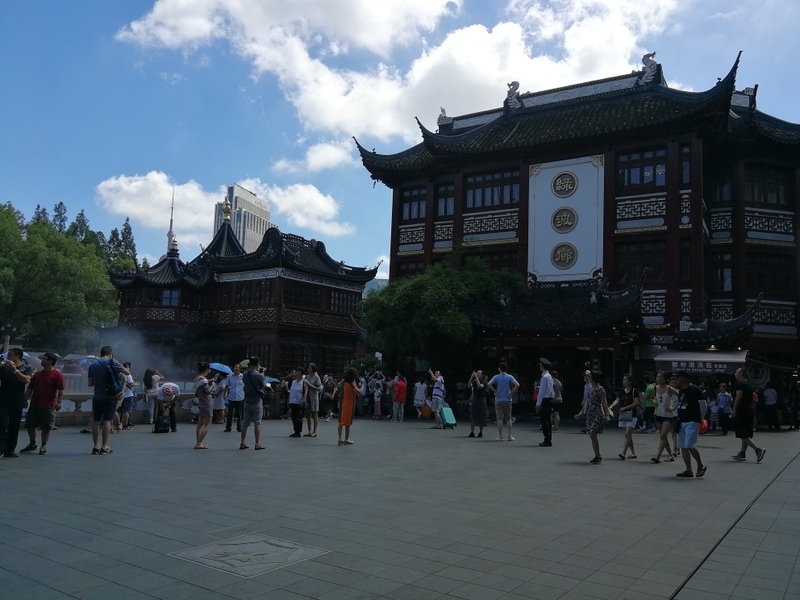 The building itself, like most of the Yu garden, originated during the Ming dynasty by the son of the elderly Prime minister Pan En. It was originally a reception hall ( a massive four story one at that). Like the rest of the gardens, the opium wars, Taiping rebellion and government transitions took it’s toll, but in 1924, it was reopened as a teahouse. … then the Japanese came… most of the Yu Gardens ( and Lu Bo Lang) were destroyed…. The civil war should have dealt a death blow, but it didn’t. Rather than raze the gardens, Mao rebuilt them: Yu Gardens 2.0 circa 1961. Lu Bo Lang took a bit longer to get back. 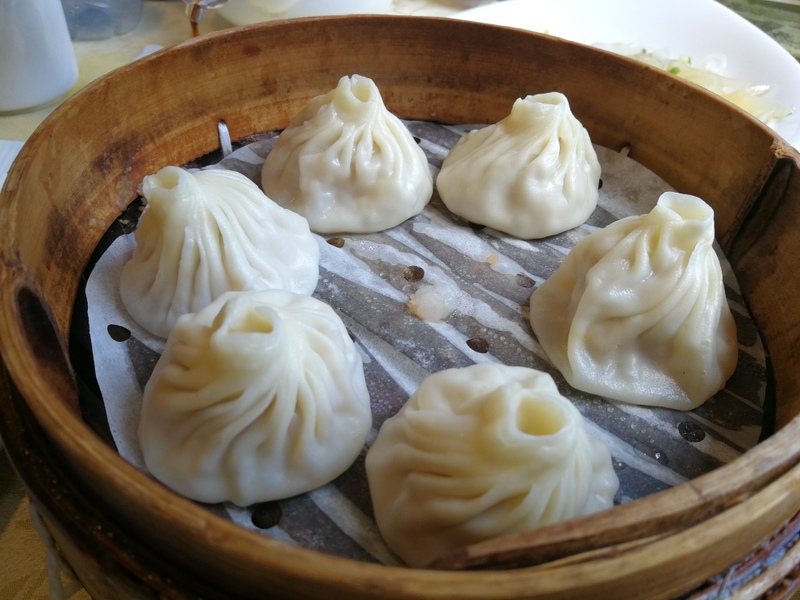 It finally opened in 1979 as a restaurant serving up Shanghainese classics, and has really taken off. 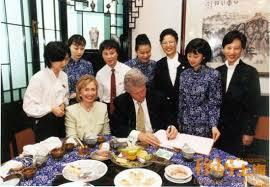 Since opening, it’s been a favorite of dignitaries including the Clintons and Castro! Today, it’s as busy as ever. People start lining up at at 10 for a spot on the weekends- no reservations. So, what are we waiting for… Let’s eat! 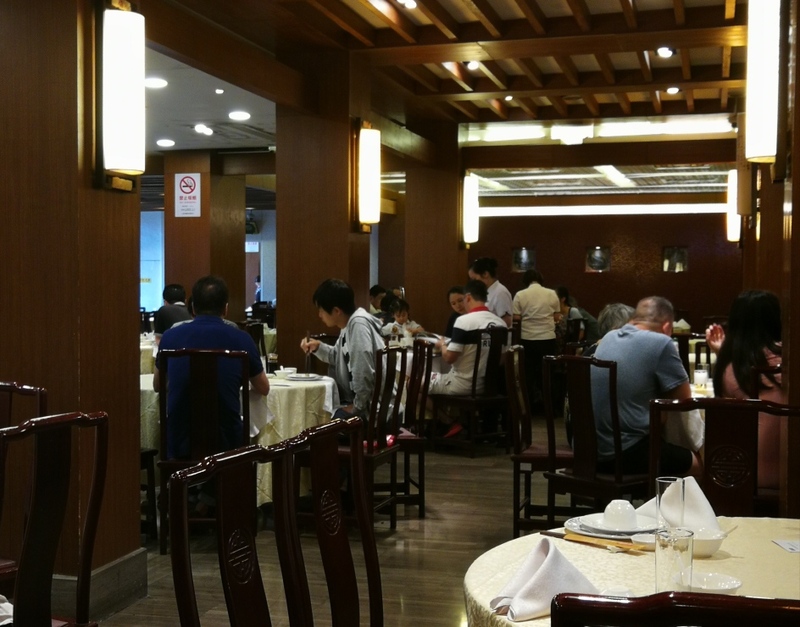 Lu Bo Lang is famous for it’s Shanghainese dim sum classics. Unfortunately, most of them aren’t available on weekends until “afternoon tea”. But, no worries… here’s what we got! 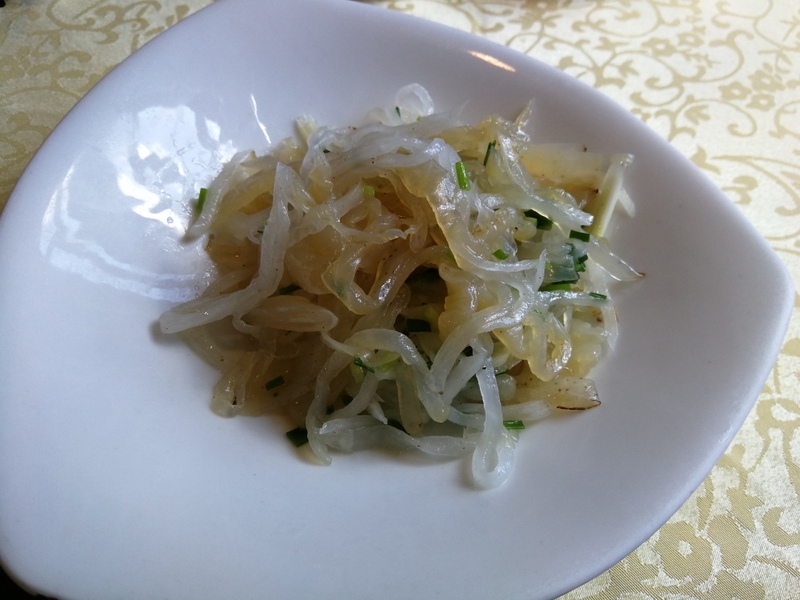 Scallion oil Jellyfish and Radish- When it comes to Chinese appetizers, it’s hard to go wrong with marinated jellyfish. This dish didn’t disappoint. The julienned jellyfish provided a pleasant snap while the radish gave a much needed refreshing crunch. I’m usually not a fan of dishes with “oil” in the name, but this dish wasn’t greasy at all. Instead the oil brought out the fragrance of the scallion. Crab Roe Lion’s Head Meatball- This is another one of their signature dishes, and for good reason. The meatball was not only tender but velvety. It literally soaked up to incredibly umami chicken crab roe broth- no lack of flavor here. 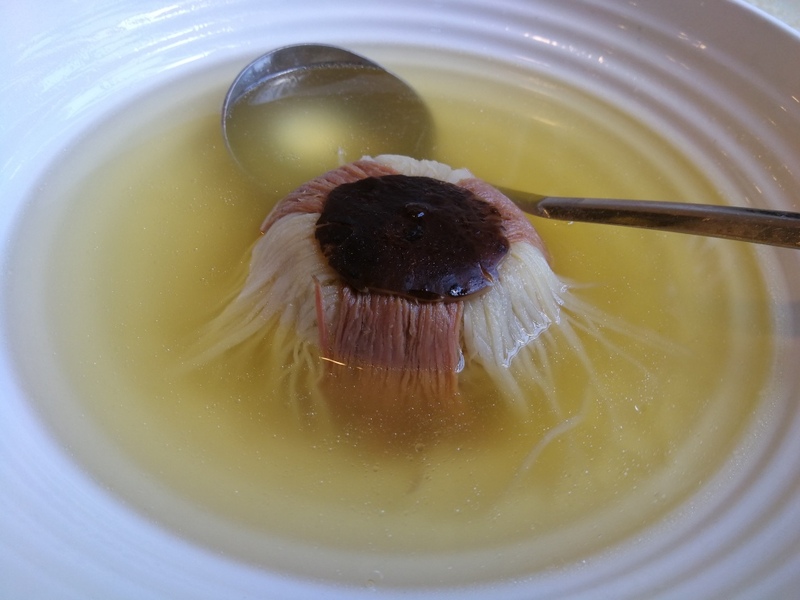 However, the broth was a bit too oily for my taste. Three Treasures in Soup- Yet another signature dish worth its title. 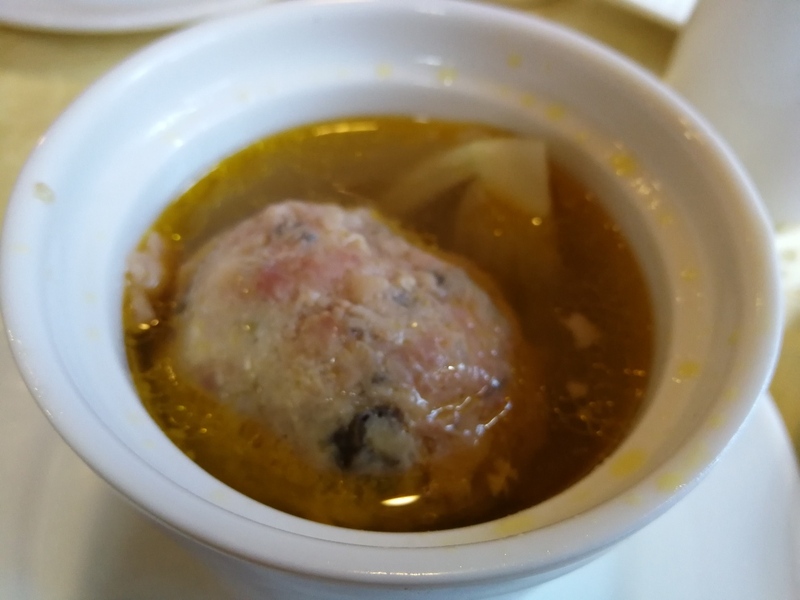 This dish consists of bamboo, ham and chicken painstakingly julienned into thread- thin slices and boiled in the most amazing chicken soup. The trade off? It takes over 40min to come out. By that time, we were stuffed, but still managed to clean this dish off. It was that good. The atmosphere was definitely one of the highlights. 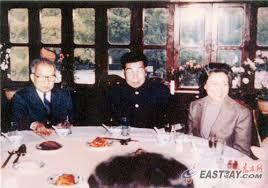 It had the excitement of a good, Chinese restaurant combined with the elegance of a historical, traditional teashoue. The interior features very old, imperial decour that really elevated the entire experience. A lot of the dishes are catered to larger parties, so I’d suggest going with at least 4 people for the maximal experience. There are also private rooms ( reservations accepted) for gatherings. Service was also surprisingly good. The wait staff were courteous and quite attentive despite the lunch rush. However, they came off as slightly disingenuine. So that’s it for this week. I might take a bit of a break next week, but next time, I’ll actually be having some of Queen Victoria’s tea. 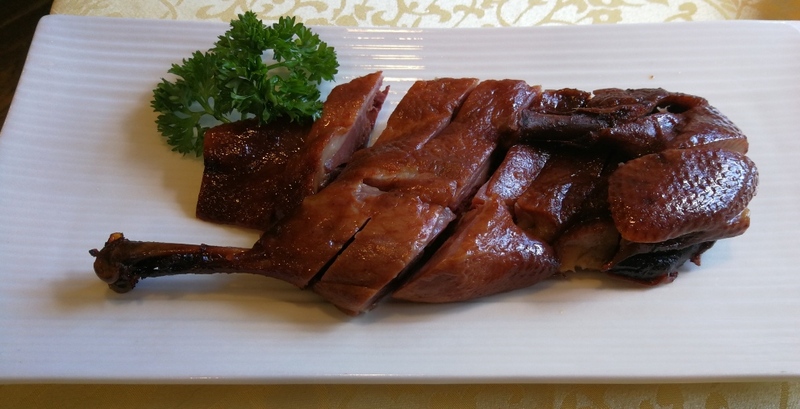 Wow, this is a famous one, nice traditional Shanghai food !